Facebook, the world famous social network seems to have tightened its security. To combat the unauthorized and suspicious activities, Facebook may now ask you to enter a Captcha, and wait, not a normal alphanumeric captcha. It will ask you to upload a photo/selfie of you in which your face is clearly visible to pass the verification process. Facebook is aiming at this verification process to subside the illegitimate activities and that users prove their identity that they are not bots. Whenever there is some suspicious activity sensed by Facebook, Facebook will automatically fire a verification activity by asking you to enter your picture as a captcha. The picture to be uploaded should have you face clearly visible. The main aim is to “help us catch suspicious activity at various points of interaction on the site, including creating an account, sending Friend requests, setting up ads payments, and creating or editing ads.” Says the spokesperson of Facebook. As per Facebook, the entire process is automated which means from identifying any suspicious activity to asking for a captcha and then verifying the picture uploaded, everything is automatic. In order to check for authenticity, Facebook then checks whether image of the user is unique and authentic. As per Facebook, both manual and automatic processes are used for this process. Facebook, however denied any more information about the system to avoid manipulation. Facebook user remains logged out for the entire process that includes asking the captcha and till the picture is verified. Once the process is complete and you pass the test only then user will be able to log in. Another concern that users may have is what will Facebook do with their pictures once the process completes. 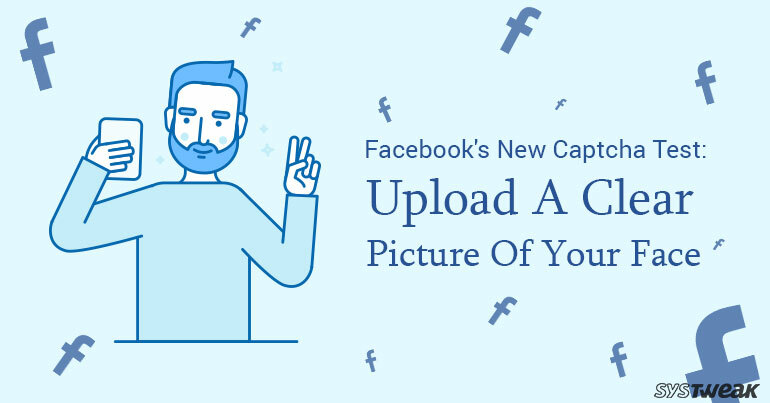 This however, has been made clear by Facebook in a tweet which shows the prompt that one of the users got while being asked to upload his/her picture. It clearly states the picture will be permanently deleted from the servers. Facebook’s recent step to check authenticity is believed to be a preventive measure to stop incidents where people have been reported as publishing misleading content. It is evident that Facebook’s latest step owes to the fact that in October almost 126 million Facebook users in the U.S. reportedly saw information published on Facebook by Russian government backed accounts. What’s your call on this new security check? Do you think this new security check posed by Facebook is right in its way to identify any user’s individuality? Do leave your comments in the comments section below.